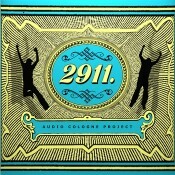 See those guys jumping on the cover of Audio Cologne Project’s 2911 ? They’re jumping because they just got a jolt of this prog-drenched, Krautrock-influenced musical adrenalin. ACP, if I may call them that, are a power trio consisting of keyboardist Dave Pearson, aka Computerchemist, guitarist Uwe Cremer, aka Level Pi, and drummer Zsolt Galántai, who played with Pearson on last year’s Signatures release. This is a flat-out fun, turn-it-up offering that kickstarts with the wild ride of “Chemist’s Bike” and doesn’t much let up on the gas until the last note. While all three players are rock-solid, it’s Cremer who acts as your sonic tour guide for most of the release. It’s obvious to me that before playing, he soaks his guitar overnight in serious blues, then proceeds to wring every sweet drop out of it while he plays. And by blues I mean thundering 70s-style blues-rock blues, equal parts fire and gritty emotion. He absolutely crushes it on “Chemist’s Bike,” and later lightly smokes his riffs in Middle Eastern flavors on the 20-minute epic, “Spieluhr.” Throw in some guitar effects, and things get nicely trippy. In the latter half of “Spieluhr,” he again lets fly with more aggressive lines, hitting the wah-wah good and hard to slide the notes right into you. Of course, all this praise for Cremer is not meant to short the other players, because this is a big batch of effective chemistry. Galántai anchors the trio with his massive fills, driving the frenzy from the rhythmic side. Pearson, as ever, contributes masterful sequencer lines to support Cremer’s flights and lend a crisp and not-too-nostalgic Berlin School feel to the proceedings. In addition, he handles bass guitar duties, most notably the fast-running riff that kicks off and then underscores “Grobmotorik.” (And also, a nice break in “Chemist…”) On “Mind the Gap,” he serves up a sweet, jazzy electric piano solo, its creamy smoothness standing in contrast to the raw guitar licks coming from the other side. This another great long track, which the trio modulate through several tempo and tone changes. Along with its rock bombast and jazz, it also has some fairly Floyd-like moments, quiet passages where Cremer shows his soulful side. Listen carefully for Pearson’s sequencer bubbling under the surface of his keyboard solo as the piece draws to a close. Great attention to detail. While Cremer and Galántai have worked effectively with Pearson before on their own, the decision to bring everyone into the fold was a very, very good one. The three mesh perfectly, and this release is just full of pure musical joy. I have been a Computerchemist fan for quite a while, and for me, Audio Cologne Project is Computerchemist on steroids. Everything I’ve enjoyed about Pearson’s work just gets amped up here. I have taken the 2911 ride many times since I received it, and I expect it to stay in heavy rotation at Hypnagogue HQ. Like I said, it’s just damned fun. Grab this, and enjoy yourself. Available from the Computerchemist Bandcamp site.